The OnePlus 6T does not have a 3.5mm headphone jack, meaning to enjoy listening to music on the phone, you either have to deal with a dongle, use OnePlus’s own USB Type-C Bullets headphones, or turn to a wireless Bluetooth connection. The good news is, OnePlus continues to be one of the few manufacturers that adds Bluetooth AptX HD into its phones. It’s a wireless audio codec that provides a greater-than-CD quality sound when using compatible wireless headphones. To experience AptX HD, you need to follow a few simple stages to get it working. Here’s our guide to enjoying AptX HD on your OnePlus 6T. If you haven’t bought a OnePlus 6T yet, read our OnePlus 6T review to find out why you should. Owning the OnePlus 6T gets you only halfway to AptX HD audio nirvana. You also need an AptX HD-ready pair of headphones. That’s right, your old pair of well-used in-ears that came free with an old phone won’t cut it here. You’re going to have to splash out, but it’s worth it. The easiest way to find out what headphones are ready for AptX HD is visit the AptX website, where you’ll find a complete, up-to-date list of compatible hardware. We are particular fans of the superb Sony WH-1000xM2 headphones, the amazing Audio Technica ATH-DSR9BT over-ears, and the excellent Bowers & Wilkins PX noise canceling headphones. More products are being released with AptX HD support all the time, so if you don’t find a pair to suit right now, do keep checking back. 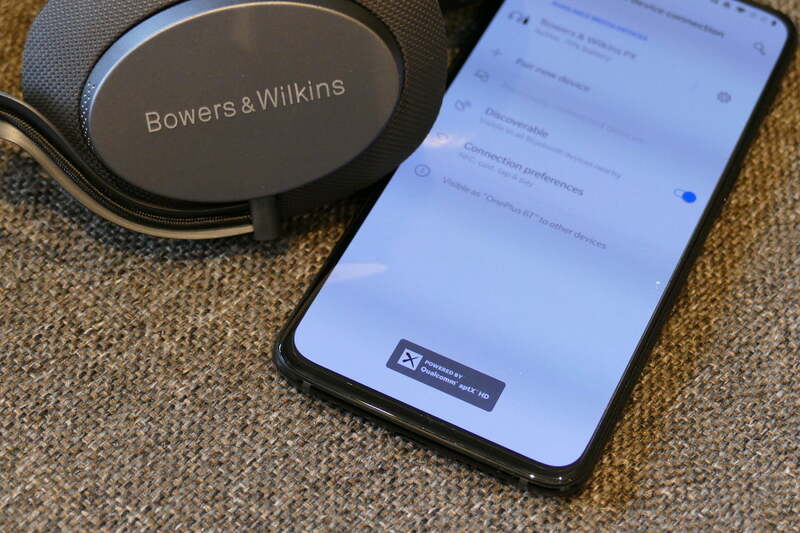 Prepare your headphones to pair, and open Bluetooth on your OnePlus 6T by going to Settings, and Bluetooth & Device Connection, then tap Pair New Device. Look for your headphones in the list, then tap pair. Unlike previous OnePlus phones with AptX HD, you do not need to do anything else, and the codec should instantly activate. You’ll know because an icon saying Powered by Qualcomm AptX HD will appear at the bottom of the screen. If for some reason this does not show up, there is another setting to check. With the headphones paired, return to Settings, and Bluetooth & Device Connection, and look for your headphones in the Available Media Devices list. Tap the cog icon to view the settings. Look for the HD Audio option, and ensure it’s toggled on. If this does not appear, or is greyed out, your headphones may not be AptX HD compatible. That’s it. You’re now set up for the best wireless audio quality you’ll hear. When you use AptX HD and play hi-res files, the sound is as close to high resolution audio quality usually provided by wired headphones as you’ll get. It plays up to 48kHz/24-bit LPCM audio, and it’s genuinely unlike any wireless Bluetooth experience you’ll have had before. To get this, you should use hi-res sources, such as Tidal HiFi, or your own hi-res music files. Playing regular MP3 files, or music from Spotify, will sound better using AptX HD; but it won’t be the eye-opening experience you’ll have with hi-res content.